Abstract: Metabolomic approaches have been documented to have great value in phenotyping and diagnostic analyses in plants1. 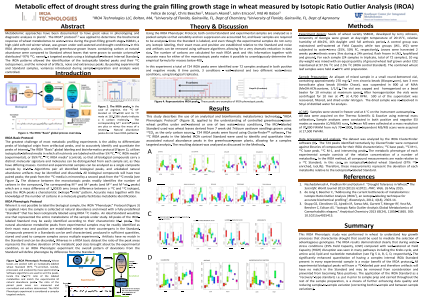 The IROA® protocol2,3 was applied to determine the biochemical response of wheat metabolomes to water-stress during the grain filling growth stage. SS8641, a high-yield soft-red winter wheat, was grown under well-watered and drought conditions. In this IROA phenotypic analysis, controlled greenhouse-grown leaves containing carbon at natural abundance were compared to Standard wheat leaves that were grown to contain universally-distributed ~97% 13C; namely, a targeted analysis using a biologically-relevant Internal Standard. The IROA patterns allowed the identification of the isotopically labeled peaks and their 12C isotopomers, and the removal of artifacts, noise and extraneous peaks. By pooling experimental and Standard samples, variances introduced during sample-preparation and analysis were controlled. Summary: This IROA Phenotypic study was performed in wheat to understand key growth processes that characterize drought that could be used to mediate the selection of advantageous genotypes. The IROA results demonstrated clearly that during water-stress conditions (25% Field Capacity, LOW) compared with well-watered at Field Capacity (HIGH) disruption was seen in many pathways including the Krebs cycle, and amino acid, lipid and nucleotide metabolism.References: Nezhadahmadi A, Prodhan KH and Golam F. “Drought Tolerance in Wheat.” The Scientific World Journal 2013 (2013): 610721. PMC. Web. 26 May 2015.
de Jong F, Beecher C, “Addressing the current bottlenecks of metabolomics: Isotopic Ratio Outlier Analysis (IROA®), an isotopic-labeling technique for accurate biochemical profiling”, Bioanalysis, 2012, 4(18), 2303-14.